Hioki Memory HiCorders are high-speed waveform monitoring and recording devices that can simultaneously measure multiple quick-changing phenomena due to complete isolation between channels and from each channel to the ground. 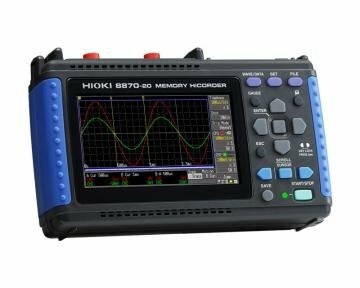 The 8870-20 is a handheld data acquisition (DAQ) recorder built in with 2 analog channels and 2MW of memory, suitable for elevator maintenance, machine, motor and inverter fault analysis, testing and inspections. Note: Input cords and Battery pack are not included. Purchase the cords appropriate for your application separately. The AC Adapter Z1005 is included as standard. AC adapter Z1005: 100 to 240 V AC (50/60 Hz), 30 VA Max. The installed battery pack charges when the AC adapter is connected. Charging time is about 200 minutes at 25°C.